The Lake Wanaka diatreme represents an eroded Oligocene maar-diatreme volcano situated within the Alpine Dike Swarm, northwest Otago, New Zealand. Current levels of exposure display lithofacies that are characteristic of lower diatreme and root zone deposits. There are four main lithofacies exposed within the Lake Wanaka diatreme; (1) country-rock breccia, (2) lapilli tuff and tuff breccia, (3) schist megablocks, and (4) coherent lamprophyre. The country-rock breccia is monomict and composed of randomly orientated schist clasts millimetre to a metre in size with no juvenile material present. Lapilli tuff and tuff breccias are unbedded, poorly mixed, and clast-supported by juvenile pyroclasts. They contain common composite loaded pyroclasts with dispersed schist lithics within. The schist megablocks are large blocks of schist country-rock up to 4 m in size that protrude from cliffs of the coherent lamprophyre. The coherent lamprophyre is the most prominent rock within the diatreme, is typically columnar jointed, and contains xenoliths of schist and peridotite, plus amphibole megacrysts. The country-rock breccia represents the deposit of rock fall into an open cavity, sourced from weakened and unstable wall rock. The open cavity was created by explosions, probably thermohydraulic, within the root zone that drove volcanic material upwards, leaving behind a temporarily evacuated volume. Further volcanic activity produced shaking that led to the clasts of the country-rock breccia becoming tightly packed in places and caused brittle fragmentation at clast contacts. The large schist megablocks were slabbed off the vent wall, and accumulated on a ledge before becoming enveloped by the lamprophyre. Lapilli tuff and tuff breccia were primarily deposited as spatter. Local agglutination textures can be seen at the point contacts of some juvenile pyroclasts, implying they were above the minimum glass transition temperature. Fragmentation of the magma was driven by bubble bursts or more intensive lava fountaining inferred to have been driven by vapour explosions generated by magma-water interactions at depth. Abundant composite loaded juvenile pyroclasts formed when wall rock lithics were shed into the magma prior to, and during fragmentation. Void space that remained between clasts in the lapilli tuff deposit was later cemented by ankerite. Isotopic signatures of the ankerite suggest it was sourced from mixing between meteoric waters and atmospheric CO2. The columnar jointed coherent lamprophyre is interpreted to have been a late stage intrusive sill that entrained schist xenoliths of various sizes as it intruded the diatreme. Paleomagnetic determination of emplacement temperatures suggests that the lapilli tuff was deposited hot, above 580 °C and the same deposit was later reheated to 295–349 °C. A schist xenolith in the coherent lamprophyre was heated to a minimum of 630 °C. These results indicate high temperatures in the diatreme soon after lapilli tuff deposition, and later heating when a nearby lamprophyre sill was intruded. 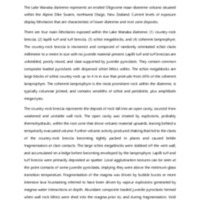 Maloney, Samuel Peter (Sam), “Volcanology of the Lake Wanaka diatreme in the Alpine Dike Swarm, New Zealand,” Otago Geology Theses, accessed April 22, 2019, http://theses.otagogeology.org.nz/items/show/635.